We stayed here for 2 nights half board. 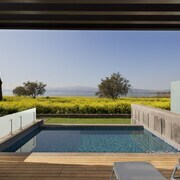 We very much enjoyed our stay, and the views over the Sea Of Galilee really were stunning. Get a lake view as the small amount extra is very much worth it. Meals were great and there was some variety day to day. The location just out of Tiberias was ideal as we had a car, so being out of the business and tourist trap was much better than in the city. Very glad we stayed here. The Hotel is next to the sea of Galilee. Wonderful view. Rooms are clean. Breakfast is more like a branch with many different choices of food. Stuff is friendly and helpful. 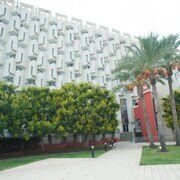 This is my second stay, will come again. Where to find Giv'at Yo'av hotels near an airport? Where can I find hotels in Giv'at Yo'av that are near tourist attractions? Spending some time in Giv'at Yo'av? Looking for a place to relax? 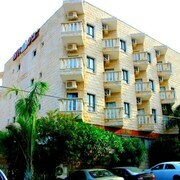 Giv'at Yo'av features around 10 hotels within a 0.1-kilometre (0.06-mile) distance of the town center. A great choice if you want to stay near the center of Giv'at Yo'av, is the Genghis Khan in the Golan. The Mizpe Hayamim is 25 kilometres (15 miles) from the middle of Giv'at Yo'av. 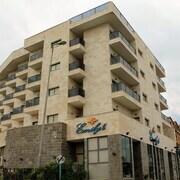 Alternatively, the Bayit Bagalil Spa Hotel is 25 kilometres (16 miles) away. Another possibility is to book a room at the The Scots Hotel or the Palacio Domain Safed Luxury Boutique Hotel. Why not spend a few hours visiting Magdala and Mount Arbel, in Migdal, 18 kilometres (11 miles) to the west of Giv'at Yo'av. 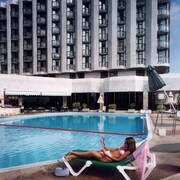 Some of our recommended Migdal hotels include the Nof Ginosar Hotel and Golan Hotel Tiberias. 14 kilometres (9 miles) to the southwest of Giv'at Yo'av, you can also stay at Degania Alef, home to the Degania Bet Resort and Ohalo Manor. 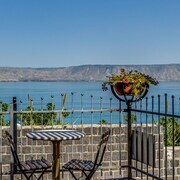 The Yardenit Baptismal Site and Bet Gabriel on the Kinneret are just a couple of the more popular sites to experience for those visiting Degania Alef. Just because you are far from home, doesn't mean you can't enjoy your love of all things sport. You'll find Kiryat Eliezer Stadium 65 kilometres (41 miles) to the west of Giv'at Yo'av. Those sports fans wishing to find a room or apartment close to the stadium can select from the The Dan Carmel Hotel or the Leonardo Plaza Haifa. If you are traveling into or out of Haifa Airport and are looking to stay nearby try Bay Club Hotel - An Atlas Boutique Hotel or Rothschild Mansion. What are the most popular Giv'at Yo'av hotels? 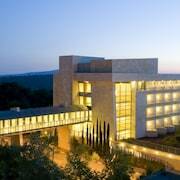 Are there hotels in other cities near Giv'at Yo'av? What other types of accommodations are available in Giv'at Yo'av? Explore Giv'at Yo'av with Expedia.ca’s Travel Guides to find the best flights, cars, holiday packages and more!